What is Map Algebra (Raster Math)? You don’t need a doctorate in mathematics to do map algebra. Because all you really need are at least 2 raster data sets and a math function. In a raster data set, each cell represents a value at a given location. 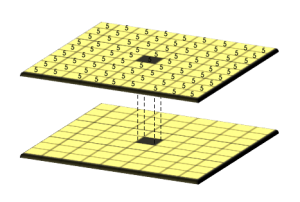 A grid cell could represent anything – temperature values or precipitation volume. 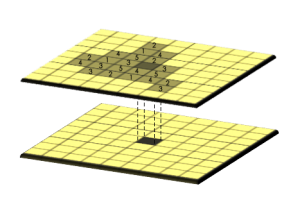 The map algebra tool is a cell-by-cell combination of raster data layers stacked on top of each other. 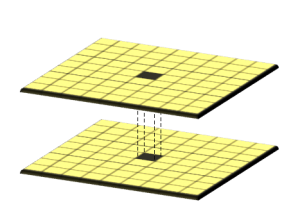 A simple operation like addition or multiplication are applied to each raster cell location. Map algebra generates a new raster output based on the math-like expression. The simplest approach is performing map algebra on a cell-by-cell basis with two raster data sets. This is an example of a local operation. But cell configuration can vary. Map algebra can be defined as local, focal, zonal and global operations. Here are examples of each type of map algebra. The value generated in the output raster is a function of cell values at the same location on in the input layers. When you take the temperature average in each cell using two raster grids, this is an example of a local operation. A global operation is a process or function that is performed on each output cell using all of the cells of the input raster. 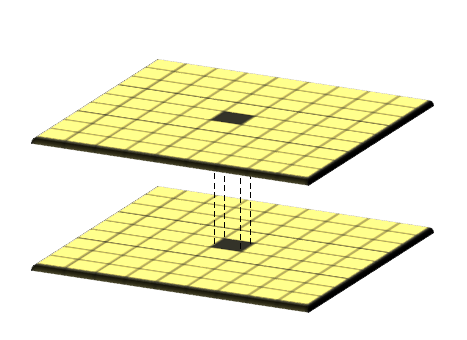 For example, the Euclidean distance tool is an example of a global operation because it calculates the closest distance away from the closest source. 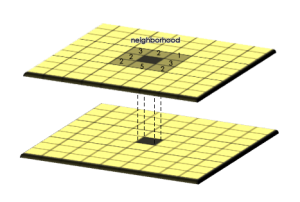 The focal operation is a spatial function that computes an output value of each cell using neighborhood values. 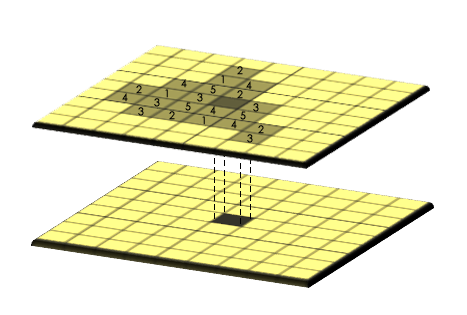 Convolution, kernel and moving windows are examples of image processing techniques that use focal operations. A moving window is a rectangular arrangement of cells that applies an operation to each cell in a raster dataset while shifting in position entirely. 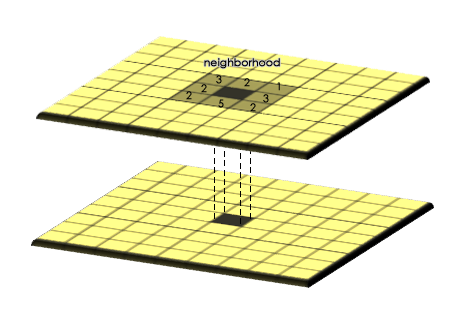 A neighborhood operation is a spatial function where the output location, area and extent comes from areas larger than and adjacent to the input cells. For example, average neighborhood operations smooth values in a map. 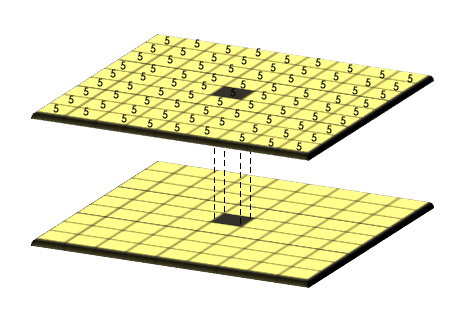 A zonal operation is a spatial function that computes an output value of each cell using the zone containing that cell. An example of a zone could be a watershed. When you want to calculate the total mean volume of precipitation in each watershed zone, this is an example of when you would use a zonal operation. NASA’s Land Surface Temperature rasters show how warm or cold Earth’s features (bare soil, snow or ice cover, cropland and forest canopy, etc) are during the daytime. 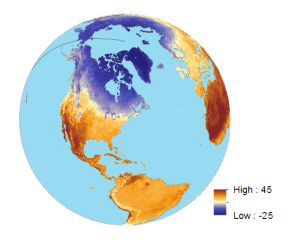 Land surface temperature should not be confused with air temperature because land surface is the skin of the Earth. Scientists want to measure global land surface temperature because it’s useful for understanding crop conditions, weather patterns and climate change. Moderate Resolution Imaging Spectroradiometer (MODIS) instruments measure the top 1-millimeter of the surface using thermal infrared. This is an example of an arithmetic local operator because each cell is being subtracted from one year by another. 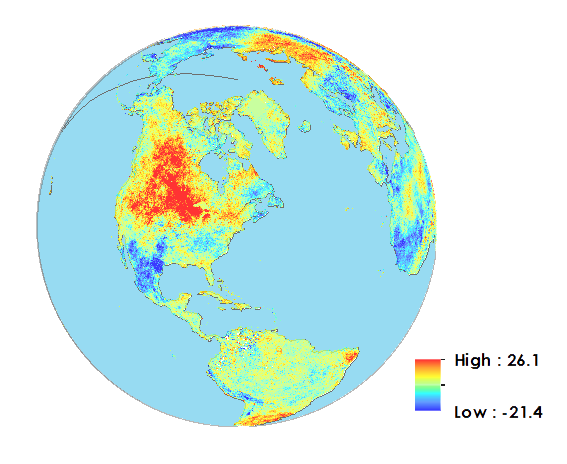 Using two raster layers, each grid cell had a value representing land surface temperature in 2014 and 2015. These grid cells overlapped each other and ranged from -25° to +45° Celsius. We subtracted 2014 from 2015 land surface values for each cell. 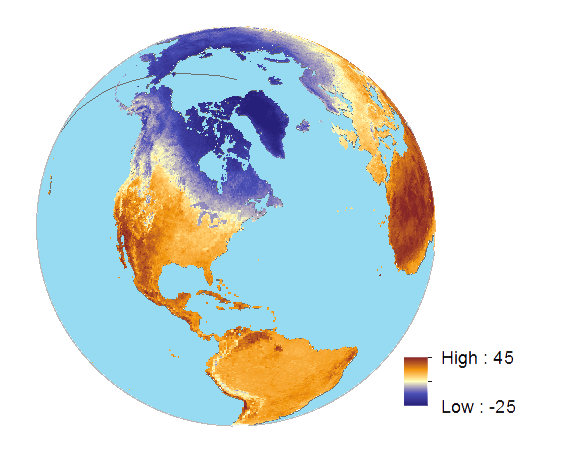 As a result, the output map has a range from -40° to +40° Celsius. You can pinpoint cells with the greatest difference. In the resulting layer, if values are positive, this means that 2015 land surface temperatures were hotter. But if values are negative, this means that 2015 land surface temperatures were colder. What happens when you have null values? Null isn’t a numerical value. 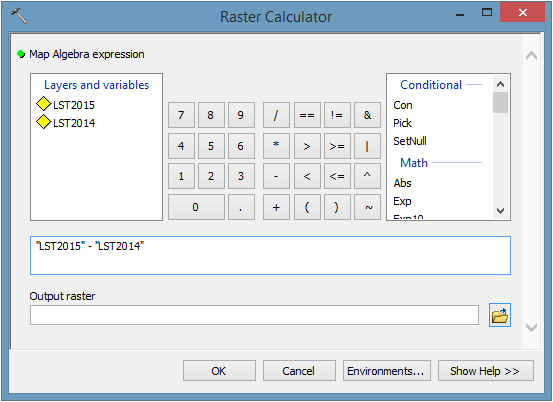 If there were null values in any of the rasters, they remained as null in the output raster. Doing map algebra in ArcGIS is as if you are running any other geoprocessing tool. RELATIONAL OPERATORS is a logical function that tests a relationship and returns true (as the value 1) or false (as the value 0). Examples of relational operators are: equal to, not equal to, less than, less than or equal to, greater than and greater than or equal to. If you use a “greater than 0” relational operator on a raster grid, the output raster grid will return the value one for all positive values and zero for all negative values. STATISTICAL OPERATORS calculate statistics for each cell by using a statistical function such as minimum, maximum, average or median. You can really crunch numbers using tools like zonal statistics. This tool uses a statistical operator to crunch numbers of all the cell values within a zone. 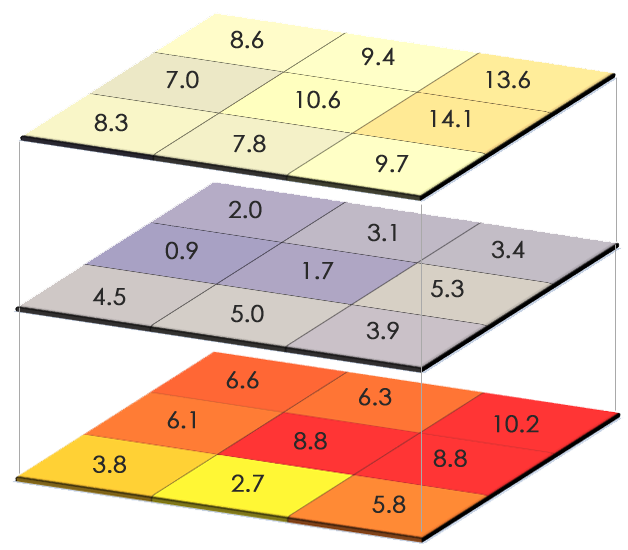 Zonal mean, zonal median, zonal minimum – these configurations help GIS users for times in need. All the cells within a zone have the same value for the raster output. 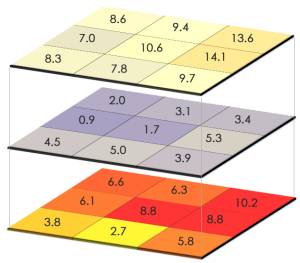 In a zonal statistics output table, each row represents a unique zone. 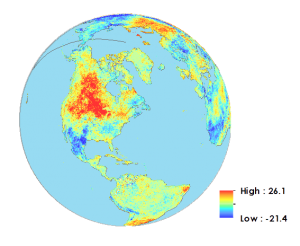 Land Surface Temperature Data provided by NASA’s Earth Observatory Team, using data provided by the MODIS Land Science Team. I really love this and have applied this method in my thesis but i struggled to get where it was applied and I am now relaxed it is commonly used.